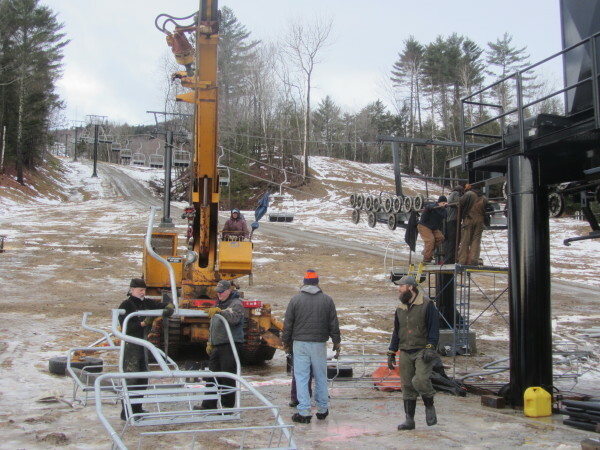 The installation of chairs on the triple lift at the Camden Snow Bowl is shown on Jan. 19. CAMDEN, Maine — The chances of a new lodge for the Camden Snow Bowl being built this year are slim to none. That news came during an early morning meeting Monday between the Camden Select Board, the Ragged Mountain Redevelopment Committee, and the Ragged Mountain Foundation. At the meeting, a chairman of the redevelopment committee said the projected cost of completing all parts of the original plan — including the lodge — would be $1.9 million more than initially had been estimated. Rick Knowlton, the committee co-chairman, said trail construction and subsequent stormwater management has cost far more than projected. Lighting also cost far more than projected. He stressed, however, that there is no financial crisis that would affect the town since there is adequate money available to cover expenses already incurred. The original budget for redevelopment of the recreational facility on Ragged Mountain was $6.5 million. Camden voters approved a referendum in November 2013 to have the town borrow $2 million to go along with $4.5 million in private fundraising by the Ragged Mountain Foundation. But the cost to complete the project is now projected at slightly more than $8.4 million. The cost overruns began when a forester came in and cut more trees than had been planned, leading to mud running off the mountain and into Hosmer Pond. That forestry work directly led to $500,000 in unplanned expenses. “We did not do well with that. We spent a lot to recover from that,” Knowlton said. He acknowledged that the project may have benefited from hiring a general contractor to better oversee the work. There are few general contractors with such expertise in the eastern United States, however, he said. Knowlton said he is not happy that the Ragged Mountain supporters will have to go back out to the community and ask for more money to have the lodge completed. “We’re not happy. This is a significant challenge,” Knowlton said. Problems with the forestry work were compounded by 2014 being one of the wettest years in a century, Knowlton said. In addition to spending money to control erosion and manage stormwater, the weather delayed construction work. Select Board member Donald White Jr. said more transparency was needed. He said the five members of the board want to be able to provide the public with accurate financial information. Board member Leonard Lookner said while the lodge cannot be built this year, it needs to be constructed. Knowlton agreed, saying the lodge was a key component of the project for donors and that it will be a focal point of the recreational complex even for those who do not ski. “Let’s finish the work on the mountain and take a breather,” Knowlton said, in reference to putting off construction of the lodge. The financial figures show that lift construction will cost $1,659,000 — $370,000 more than in the original budget. Trail lighting will cost $320,000, nearly $200,000 more. Stormwater management had no money set aside in the original budget with the expected cost now at $180,000. Fundraising was budgeted originally at $143,000 and now is expected to cost $352,000. The original estimated cost for the lodge was $2,175,000 and is now projected at $2,462,000. Knowlton said there is no interest in asking taxpayers for more money. He said he does not know when the lodge can be built but that it won’t be 2015 and may not be 2016. The grim financial news came after the long-awaited opening of the triple chairlift over the weekend. Select Board Chairman Martin Cates said it was a spectacular opening weekend for the resort.